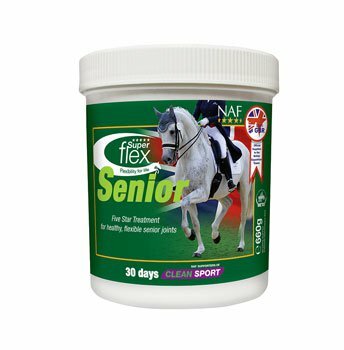 NAF Five Star Superflex Senior is a unique formulation, providing high quality nutrients key for Equine joint support. Superflex Senior works in synergy with rich natural sources of Omega 3 fatty acids and naturally sourced antioxidants to support healthy, flexible joints in older horses and ponies still leading active lives. 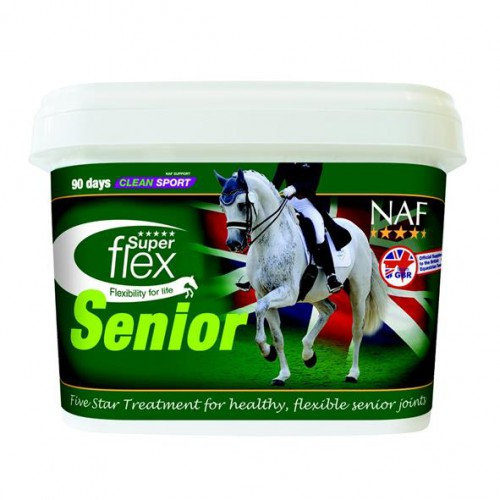 Feed Superflex Senior to maintain healthy, flexible joints in working senior horses and ponies. A 660g tub will last 30 days and a 1.98kg will last 90 days at maintenance rate. Glucosamine, Methyl sulphonyl methane,Seaweed meal, Chia seeds, Dried algae (spirulina), Glutamine peptide, Linseed oil, Chondroitin sulphate, Hyaluronic acid, Sodium chloride.